Lightweight bolt on skewers for quick-release hubs, adds extra security. Prevents theft by bolting down with 5mm Allen key. Cromoly axle, stainless springs, silver alloy end caps. 69 grams for the set. 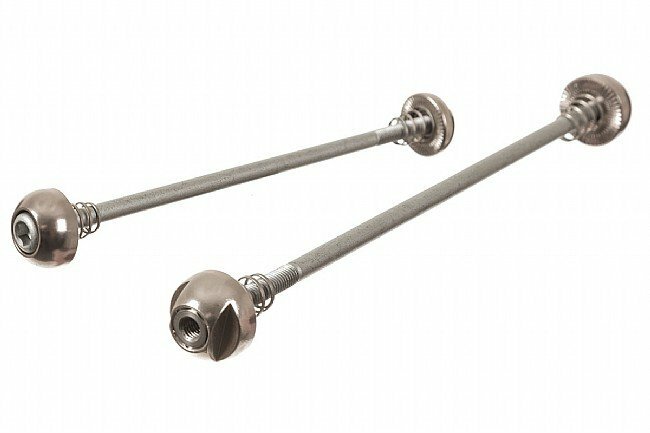 Good Product made of Stainless Steel.Metric allens that most carry for other bicycle adjustments.Wide enough for MTBs,Road bikes up to 9spds.130mm/100mm plus a few mm more.I recommend this to a lot of my tune-up/repair customers.Simple Effective,No loosening like some quick release skewers. Lock-On your favorite wheels wout the Extra gear to Carry.My Go-To Method of Not Worrying about my Wheels.I sell Hi-End Used bikes and my Customers always like this unknown feature.130mm100mm Spacing fits most Hybrids,City Commuter bikes.A great Theft Deterrent. Back skewer a little long, used a hack saw to trim the threads down otherwise functions as a skewer should which requires a allen wrench to tightenloosen. Lighter than standard skewers as well for the weight concious. Used on 11 speed road drivetrain. If you're not running a thru axle on your MTB front suspension, you might have problems with quick release skewers coming loose during rides, despite your best efforts to keep them tightened. A friend claims this is caused by heavy torque windup from hydraulic brakes, and recommended lock-down skewers as a remedy. 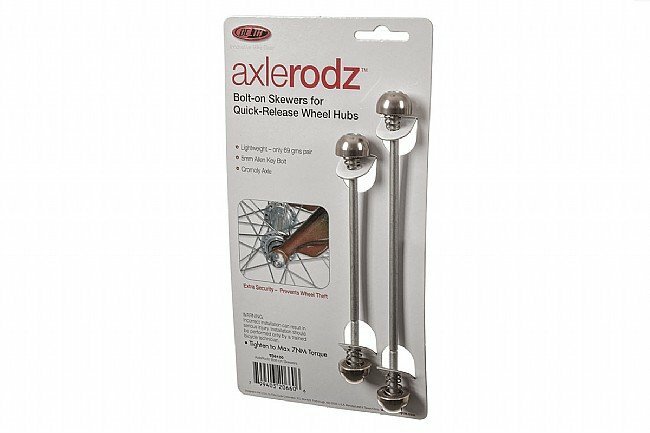 The Delta Axlerodz are a cheap and easy alternative to shelling out for a new thru axle fork, are easy to set up, and stay put so long as you adjust the locknuts properly and check them after every ride. If it isn't there it can't rust and doesn't weigh anything. My old skewer levers showed years of rust and were dragging down the look of a quality vintage bike. Easy up-grade for a small price. The length range is an issue. The threads can bottom out on narrow hubs and not be long enough for wide ones. Worked for me! Great way to secure your wheels wo the hassle of Extra locksWeight.Stainless steel hardwhere. A Really Easy Way to secure wheelset on your bike.130mm100mm Standard axles.7 thru 9 cassette that I have on Multiple Hi-End Bicycles.Better way Than Locks,Cables,Extra Weight to carry.Simple Metric Allen. Easy Replacement for Quick release skewers that work loose, rust, or just look outdated. Allen metric sized 130/100mm fit just about everything.The 130mm Rear has extra room wider for aluminum frames. Theft deterrent better than cables/locks/weight. Stainless steel and wrench on Tight! My Go-To Method of saving my wheels. Dont even have to pull the wheel.Skewer out, slips right in. Tighten w/T-Handle allen and Presto 1 minute fix. Mostly purchased to get some spare axle parts. Pleasantly surprised with the product - it's a good value for the money.